Another series is devoted to Mozart's Chamber Music starting with the Gran Partita conducted by Keith Bragg (17/1) and continuing with concerts devoted to Mozart's quintets (21/1), piano trios and quartets (28/1), Prussian quartets (5/2), piano chamber music (6/2), clarinet quintet (7/1), wind chamber music (11/1) and violin sonatas (13/2). Their Bach Cantata Series continues with Iain Ledingham directing Sie werden aus Saba alle kommen BWV65 and Gott soll allein mein Herz haben BWV169 (19/1), and Tritt auf die Glaubensbahn BWV152, Wo gehest du hin? BWV166 and Herr, deine Augen sehen nach dem Glauben! BWV102 (16/2), and Was Gott tut, das ist wohlgetan III BWV100, Ich lasse dich nicht, du segnest mich denn! BWV157 and Liebster Gott, wenn werd ich sterben? BWV8 (16/2), Gottes Zeit is dei allerbeste Zeit BWV106, Ich glaube, liebe Herr, hilf meinem Unglauben! BWV109, Schmuck dich, O liebe Seele BWV654 and O Mensch, bewein dein Sunde gross BWV622 (6/4). The period band is led be a roster of distinguished leaders including Rachel Podger, Madeleine Easton and Margaret Faultless. The Academy's percussion, organ and string departments are collaborating to perform Lou Harrison's Concerto for Organ with Percussion Orchestra inspired by Indonesian gamelan music and Joseph Pereira's Strophe for for vibraphone and string quartet. There is a chance to catch Tod Machover's opera Death and the Powers in a live simulcast from Dallas Opera (16/2). 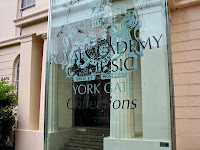 Further information from the Royal Academy of Music website.